This round, we're trying a game that's a little different. The main game is not going to be a cartridge-based game. Instead we're going to play an arcade game that uses the "Astrocade chipset." The Adventures of Robby Roto! is the main game for Round 12 of the Astrocade High Score Club. 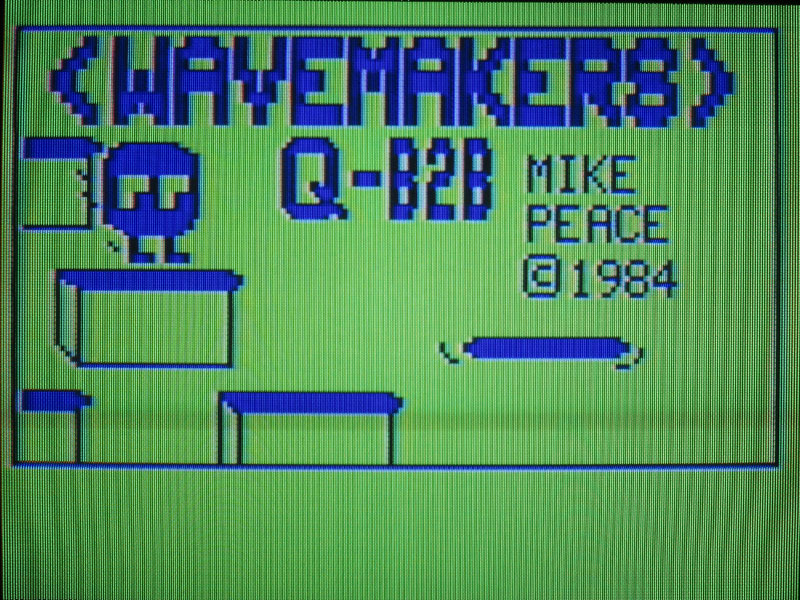 The BASIC bonus game is a Q*Bert clone called QB-2B by WaveMakers. Due to scheduling on my part, Round 12 will last about four weeks. The round ends on Sunday, November 13'th at 8pm MST. This may give more people a chance to play the game, but it will also allow people that have never set up the MAME emulator to get it going. The Adventures of Robby Roto! 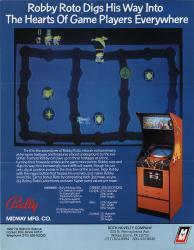 is a 40K game released to the arcades by Bally/Midway in 1981. The game uses 6K RAM, plus an additional 16K for screen RAM, and 2K for battery backed-up RAM. That means the game uses all 64K of the Z80 address space! The Adventures of Robby Roto! was written by Jay Fenton using the commercial (hi-res) mode of the Astrocade chipset. Many people immediately spot "Robby Roto's" similar characteristics to Dig-Dug, Mr. Do! or even the lesser-known arcade game The Pit (which inspired Boulder Dash). These are all games in which you move underground through the Earth collecting items. 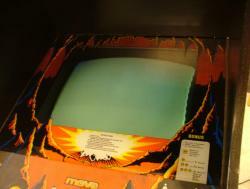 However, "Robby Roto" predates these three arcade games. If anyone knows of an underground digging game that came out before "Robby Roto," then let me know-- as I've wondered where Jay may have got his original inspiration for this game. 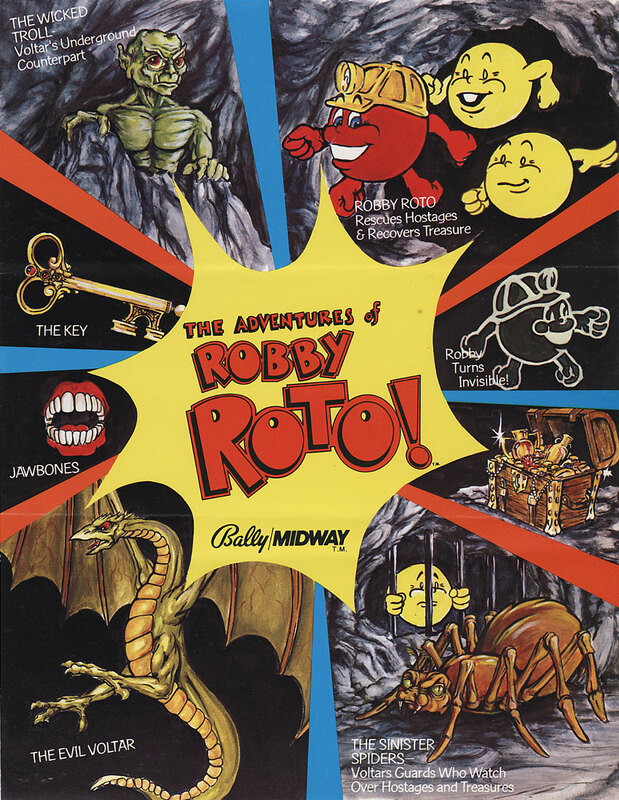 There is a colorful arcade flyer for "Robby Roto:"
Thrill to the adventures of Robby Roto, rescuer extraordinaire, as he saves hostages and treasures placed underground by the evil Voltar. Fearless Robby can save up to three hostages at a time, turning their frowns to smiles as he gains more points. 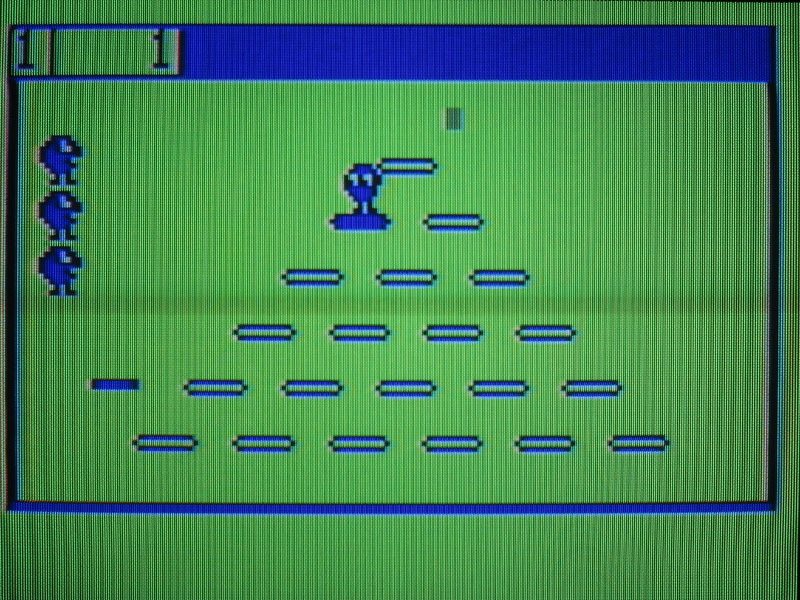 Robby runs and digs his way through increasingly more difficult mazes, though he can only dig at junction points in the direction of the arrows. Help Robby with the magic button that freezes his enemies, and makes Robby invincible. Earn a bonus Roto by completing each 3rd maze, as you dig Robby Roto's adventures and earn higher point values per maze. Guide Roto through the maze avoiding the cunning trolls and spiders. Find the key for the exit door. Grab Treasures for bonus points. Remove as many hostages each trip into the maze as possible. When all 3 are saved the maze ends. 3 hostages = 3x Bonus + Special bonus next maze!! 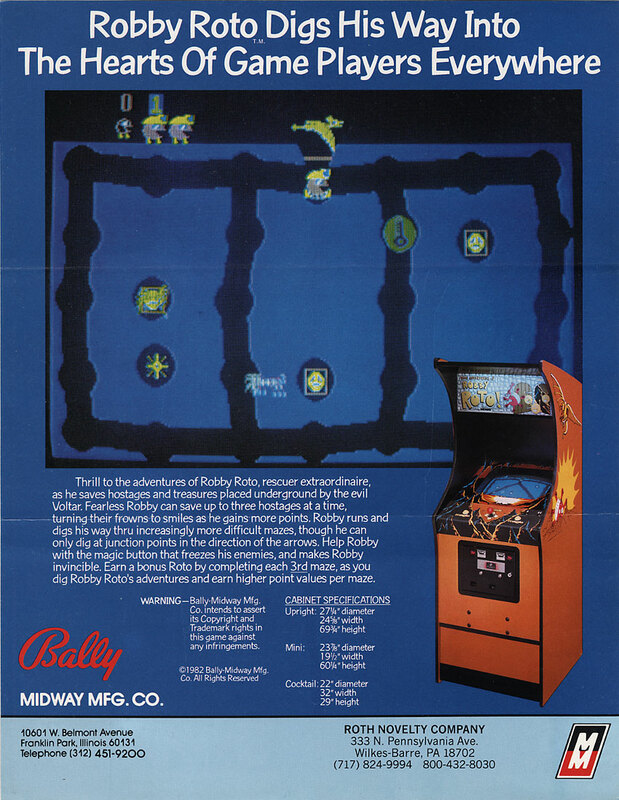 For those players who want to "dig deeper" into how the game is play, I've retyped/OCRed additional information on how to play the game from Bally/Midway's Adventures of Robby Roto - Parts and Operating Manual. These instructions are much more detailed… maybe even too detailed for some people. ROTO is a one or a two player game. There are three models: the "UPRIGHT", "MINI", and "COCKTAIL TABLE". 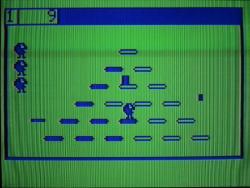 When the two player mode is selected on the Upright or Mini model, the players take turns at the controls to guide ROTO to the stolen treasures and the captured hostages while avoiding VOLTAR and his co-conspirators. If you have purchased the Cocktail Table model of this game, the rules of play are the same. The only difference is that in the two player mode of the Cocktail Table game, the picture flips to face you when it's your turn. When playing this game, YOU are ROTO's mentor. He takes his directions ONLY from YOU and will do your bidding exclusively. YOU determine the strategies he will use to defeat the evil monster VOLTAR who has invaded the Earth, stealing all types of treasures and burying them deep within the earth. VOLTAR also takes hostages and seals them in vaults deep within the earth. There is only one way to save the hostages and recover the stolen treasures. We must send in ROTO. He will follow VOLTAR right into his own home tunnels to rescue the hostages and recover the stolen treasures VOLTAR has salted away. To say the least, this makes VOLTAR more than just a little bit upset with ROTO. To help protect his stolen treasures and kidnapped hostages, VOLTAR has developed a breed of giant SPIDER that can sense ROTO's location and that can also travel through solid earth. These SPIDERS attempt to corner and capture ROTO. And to direct their hunt for ROTO, VOLTAR turns himself into a TROLL that can travel through solid earth. 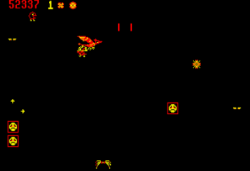 If and when ROTO is captured by the SPIDERS or the TROLL, he is forcibly ejected from VOLTAR's tunnels and you lose one player. As your skill level increases and you get into the higher racks of the game, the ability of the SPIDERS and the TROLL to sense ROTO's location increases. This makes ROTO's chances of survival considerably smaller. And VOLTAR, being what he is, has reinforcements in the form of a set of disembodied TEETH that he can call on to help him track ROTO down and put the bite on him. These TEETH also have the ability to travel through solid earth. ROTO has no reinforcements he can call on to help him defend himself against his enemies. He has ONLY YOUR SKILL at maneuvering and forming strategies plus one use of the MAGIC button (which makes ROTO and any hostages he has with him invisible to all monsters for a short period of time) per rack to keep him safe as he carries out his rescue missions. Bonus ROTOs are awarded to you periodically throughout the game: after you complete every third rack of the game. Each recaptured treasure and rescued hostage has an assigned point value as listed in Figure 1-1. In the "2 times" and "3 times" racks, the values of all items are doubled or tripled respectively. A bonus ROTO is awarded to each player after every third rack completed. The award of these bonus ROTOs is NOT tied to any scoring ability of the player (a low scoring player can receive just as many bonus ROTOs as a high scoring one if he can survive as long as the other player. survivability is what the award of bonus ROTOs is tied to). Your ROTO is allowed one use of the MAGIC button per rack of the game. If you do not use the MAGIC button in any particular rack, you are allowed to accumulate your unused MAGICs. When you do use the MAGIC button, your ROTO and any hostages he has with him at that time will become invisible to all the monsters on the screen for approximately 5 to 7 seconds (he can go right through them and not be caught). The Upright model is provided with a front slide out service shelf for ease of maintenance. All models are provided with a service outlet to aid the service technician and provide an electrical source for whatever purpose he may have in mind. The object of the game is to HAVE FUN and survive as long as possible while constantly improving your skills, rescuing as many of the hostages as you can, and recapturing as much stolen treasure as possible. As you do this, each following maze will be harder and harder to complete. 1. The Play mode begins when either the "1 PLAYER" or the "2 PLAYER" start button is pressed. 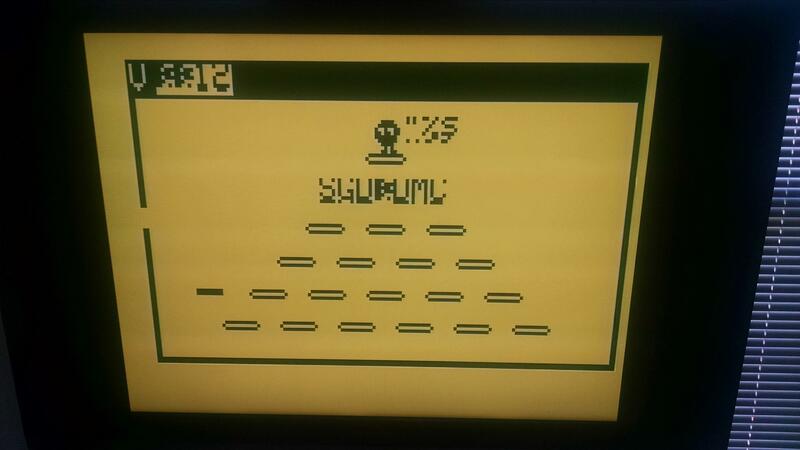 "PLAYER 1 UP" or "PLAYER 2 UP" is displayed centered on the screen ONLY when a 2 player game has been selected. In a 1 player game, the screen says "GET READY" and play begins. 2. The Play mode ends when all of your ROTOs have been captured by VOLTAR. When this happens, "GAME OVER" is written across the center of the monitor screen. 3. The game is made up of buried stolen treasures and imprisoned kidnapped hostages which it is ROBBY ROTOs mission to rescue. The evil VOLTAR is the one responsible for all of this. When playing this game, YOU are ROBBY's mentor. He takes his directions ONLY from YOU and will do your bidding exclusively. YOU determine the strategies he will use to defeat the evil monster VOLTAR who has invaded the Earth, stealing treasurers and kidnapping hostages. 4. There is only one way to save the hostages and recover the stolen treasures. We must send in ROBBY ROTO. He will follow VOLTAR right into his own home tunnels to rescue the hostages and recover the stolen treasures VOLTAR has salted away. 5. 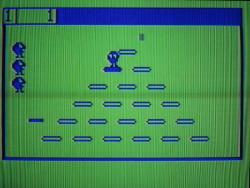 The player begins each game with 3 ROTOs and 1 Magic. Reserve Magics are symbolized by "Ghost ROTOs" behind your regular reserve ROTOs. The Magic will make ROBBY ROTO and any hostages with him invisible to VOLTAR and all his creatures. It also makes ROBBY able to move faster. If you do not use your Magic in this rack, it will accumulate to the next rack. You get 1 Magic at the beginning of each rack. When used, they will last for 5 seconds, the game makes a special magical sound, the screen flashes, and ROTO becomes a ghost image of his former self. 6. A bonus ROTO is awarded to the player after the completion of every third rack (3rd, 6th, 9th, 12th, 15th, 18th, and so on). The award of these bonus ROTOs is in NO way related to the level of a player's score. You MUST SURVIVE long enough to make it to the ends of these particular racks to collect your bonus ROTOs. There are 3 different "BONUS ROTO MACHINES". Generally speaking, a player should never get the same maze twice in any game until he has gone through all 25 of the "HARD" mazes. After the 2nd rack, all future racks are in the "HARD" category. ROBBY ROTO enters all mazes through the door at the top center of the monitor screen. When he is in the mazes, ROBBY can only dig in the directions of the pointing arrows at each room (tunnel junction point). He can move freely about any of the tunnels that have been dug out. The evil monster VOLTAR has invaded the Earth, stealing all types of treasures and burying them deep within the earth. VOLTAR also takes hostages and seals them in vaults. To help protect his stolen treasures and kidnapped hostages, VOLTAR has developed a breed of giant SPIDER that can sense ROTO's location and that can also travel through solid earth. These SPIDERS attempt to corner and capture ROTO. And to direct their hunt for ROTO, VOLTAR turns himself into a TROLL that can travel through solid earth. After watching this video, I noticed that the underground soil seems to look a little different on real hardware than it does under MAME emulation. I'm not sure if that is because of the way the video was shot, or if the emulation in MAME isn't 100% accurate. As usual, 10 points can be earned this round (excluding bonus points). There are two ways to score bonus points for "Robby Roto:"
1) Highest Level Reached - Robby Roto has thirty levels. The player who reaches the furthest level gets one bonus point. At this time, I'm not sure what is the best way to keep track of what level you're on. In case of a tie here, then the tie is broken by the player with the highest score. 2) Play "Robby Roto" on Real Arcade Hardware - Do you own the arcade game, or live near an arcade that has the arcade cabinet setup for play? If so (lucky, you! ), then you'll earn two bonus points for playing this game on real hardware. Most of us will be out of luck for these two bonus points... but anyone who can play this game on real hardware deserves something a little bet extra! 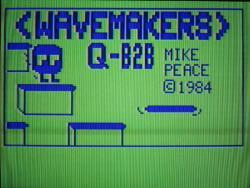 QB-2B is a Q*Bert clone that was created by WaveMakers. It was supposed to be released in 1984 on Tape 20 along with Tomb Pirates. Both of these games were unreleased. No documentation for QB-2B exists (or, at least, has been archived). If you're familiar with Q*Bert, then you'll have no problems playing this BASIC game. 1) Playing QB-2B - You get a bonus point just for playing QB-2B. 2) QB-2B High Score - You can earn another bonus point if you get the highest score for this game. 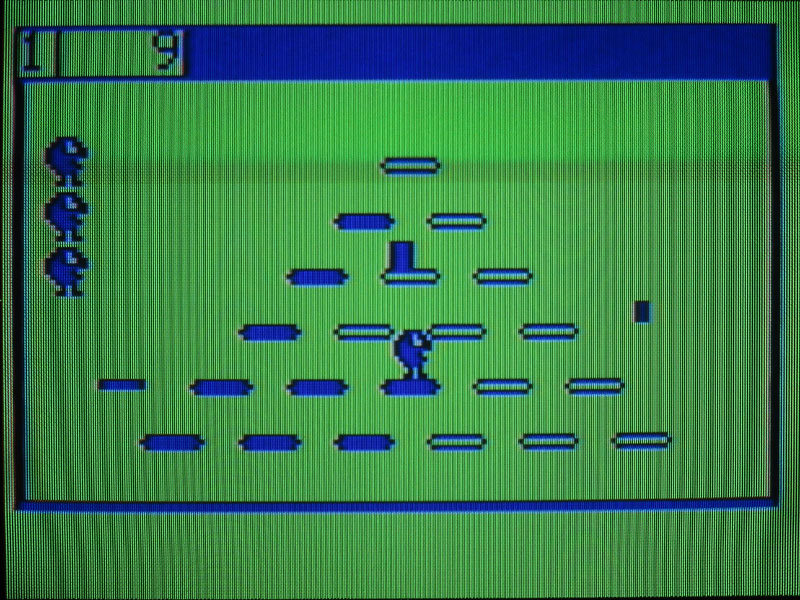 3) Video of QB-2B - To continue to promote Astrocade BASIC programs, a bonus point will be awarded to any person to upload a video of QB-2B containing a full game. If the video is a video review, then you'll earn two points! Any number of people can qualify for these points. 4) Instructions/Backstory for QB-2B - There are no instructions for this game. Anyone who comes up with a backstory and full instructions on how to play this game gets a bonus point. Be creative and have fun with this one. If there is an outrageous backstory that makes me laugh out loud, then there just might be a bonus point or two awarded here! Please post all of your scores for both games here. Scores posted on the Bally Alley discussion group will no longer be accepted. If you post a video score, then please note the score obtained in the video-- as this makes it easier for me to keep track of all the scores. 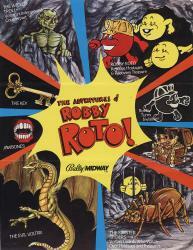 Have fun digging through The Adventures of Robby Roto! and hopping around QB-2B! Initial impressions: ["Robby Roto"] is really cool. It is pretty fun, but I wish that there was a way to turn the tables on the baddies. I'll bet the lack of this ability is why this game never caught on with the gaming public back in the early 80s. I like including the Bally MAME category on here. I know it's true that many of their cabinets used the same kind of chipset. The arcade category also helps to add a few games to the Bally's small game library. QB-2B doesn't stand a chance against a 16-bit game like this, but when judged on their own merits, even simple BASIC games can be fun. Plus, it still really impresses me just what can be wrung out of 1.8K of RAM and a few BASIC commands. I'll try to get a few round of both of the games in this week. I might try using an alternate controller for QB2B I think that would help! I noticed I've been misspelling the name of this game. According to the title screen, the game is called Q-B2B, not QB-2B. I got 52,337 on Robby Roto, and made it to level 5. It's a fun game. I like the hostage rescue element, where you have to actually get them to the exit or they can be captured again. I do wish it were easier to see where the maze is. I definitely died several times thinking I could dig through a really thin wall. I got pretty frustrated with Q-B2B. I just couldn't get the character to move consistently. I don't know if it's the game or my controller. Same score display problem as Outpost 19, though in this case it may just save me from the embarrassment of what my actual score would have been. Edited by ranger_lennier, Sun Nov 13, 2016 7:48 PM. Not many people played this round. Is that because it's "Robby Roto" isn't a well known arcade game? Is it because people prefer to play non-arcade games (i.e. "we wanna play Astrocade games!")? Any suggestions for the main game and bonus games in the next round? I just didn't have s chance. Only reason in my case. Will play if there is extension. Round 12 of the HSC ended on Sunday, November 13'th at 8pm MST. There were only two entries for the high score contest. Hopefully, more people will participate in the next round. The bonus point is awarded to ranger_lennier for reaching level 5 (of 30). That's pretty impressive, as this game gets hard pretty quickly. I enjoyed "Robby Roto," and I plan to revisit this game in the future. I'd love to try playing this one on real hardware. I wonder which arcades in the US might have "Robby Roto" now? Every player who played the BASIC bonus game gets a point. I earned an extra point for getting the highest score on Q-B2B (since Paul's score display was corrupt, I guess that isn't much of an accomplishment, is it?). Also, unlike Paul, I didn't have any issues controlling my character in Q-B2B. I wonder if somehow playing the game on the Bally Home Library Computer, which (obviously) has some compatibility issues, made it more difficult to play? I only played a couple of rounds of this game. I meant to play it more, but I didn't get a chance to "jump" into it again. I made a video for Q-B2B, so I get a point for that. I'm going to try to make videos for all upcoming games from now on. I bought myself Adobe Premiere Elements 14 last week, so maybe I'll learn how to edit these videos a little bit (right now, they're shot and uploaed in unedited form). I'd really like to make a video tutorial on how to use Bally BASIC to load BASIC programs.
! - Highest Level Reached. I should have written a backstory for this game. That would have been fun! Perhaps, I'll do that in a catch-up round. Congratulations to Round 12's winners... BallyAlley and ranger_lennier! The two games that will be played for the next round will be the same games that will be covered for the Bally Alley Astrocast podcast, episode #7. Round 13's main game will be Blast Droids, a rare third-party cartridge by Esoterica. The BASIC bonus game will be Haunted House, a sort-of text adventure game by New Image. I have no experience playing this BASIC game, so this should be interesting. I'll post the start of round 13 in the next few days, but feel free to start playing these two games anytime. Thanks for playing... Paul! As for everyone else... please, feel free to jump in during the next round! Edited by ballyalley, Thu Nov 17, 2016 3:59 PM.